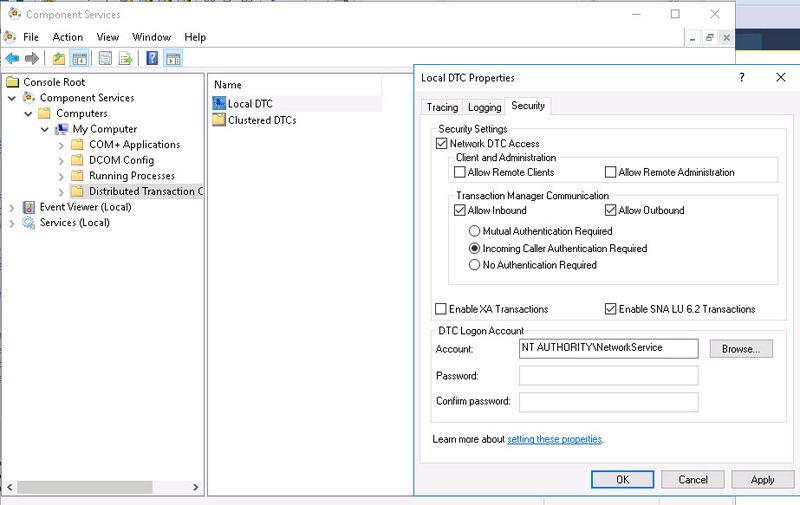 MSDTC is a acronynm for Microsoft Distributed Transaction Coordinator which is a windows service to maintain the transactions in a distributed environment. The internals of MSDTC is a black box for users, however, this service is very important to maintain the transactions between two different systems. A Distributed transaction is a transaction that spans across multiple machines.Distributed transaction will ensure if there are multi operation happens between servers, if any of the operation is failed and cancelled, none of the operations in the transaction is getting committed in a multi server environment. I am not sure if I can simply explain than this. Where do we need MSDTC? Typically, in the context of SQL Server, yes we may need MSDTC for Linked Server usages.If transaction is opened to do some operations across servers in a linked server environment, this needs to be converted as a distributed transaction to maintain the integrity of the data. We need to understand two things clearly here. 1. When two physical machines are communicating with a transaction. If you are using two instances of the same machine, DTC will not be used. However, if the instances are in a cluster, you need to use DTC as you cannot ensure the instances are in the same physical nodes in the cluster environment. 2. Irrespective of type of transaction, whether its implicit or explicit, you need to use DTC. A typical example for implicit transaction is Trigger. Please find more detail here. How to troubleshoot MSDTC issues? Troubleshooting MSDTC issues is a pain area as you will not have complete information about the DTC component. We can use DTCPing tool to troubleshoot the issues which will provide much better insights. DTCPing tool can be downloaded here. How to configure and troubleshoot using DTCPing tool? 1. On Computer A, run DTCPing.exe. 2. On Computer B, run DTCPing.exe. 3. On Computer A, type the NetBIOS name of Computer B, and then click Ping. 4. On Computer B, type the NetBIOS name of Computer A, and then click Ping. You can see more details in the readme.txt available in the tool kit. Linked Server is one of the easiest way of communicating between multiple servers/instances in SQL Server. By linking the servers, you would be able to receive/send data between the partners. This becomes handy as it may not really need *lots of* changes in your code to work, however, caveat is it may have some performance issues depending on your code and other factors. I am trying to put few best practices for you while you work with Linked Server in this post. Collation Compatible is a setting to instruct SQL Server to do the evaluation of comparisons on character columns locally. By default, the value is false. If the value is true, then SQL Server will consider that all partners of a Linked Servers are compatible regards to character set and sort order. 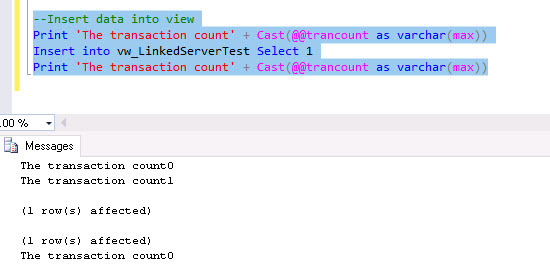 If the value is false, then SQL Server tries to process the data locally by pulling the data from remote server. This may lead to a performance issue if your remote table has more data. A word of caution: The choice of this setting should be considered at most care as this may even lead for data inconsistency if we set the value is true for performance gain and collation are different for Linked servers. PUSH or PULL are denoting how the SQL query is being operated through Linked Server. PUSH denotes the data to send (push) to the partner. PULL denotes the data to receive as required from the partner. In Linked Server world, PULL is much faster than PUSH method. Eg: If you need to get some data from Remote, Local server can PULL data from remote server table instead of pushing the data from remote server. This has an impact on performance and I personally experienced in one of my earlier projects. Having said, the amount of data pass through the network has a major impact on the performance. As much as can limit the data volume over the network, we will get better performance. It depends on the query being passed, size of tables, cardinality, type of queries etc. This is a huge topic to be discussed later and forever. SQL Server always do the best work for you, meaning, it will do most of the work at remote server and get you the required data to locally. However, sometimes, it may not happen as desired due to many factors. There are few operations that can hinder the work at remote if you use in your queries. If the user is not having any of the above roles, then the query cannot use the distributed statistics from the remote server and it will have an impact on performance. The issue with providing these roles is that compromising the security. Prior to SQL Server 2012 (SP1), this is one of “must to verify”, however, there is a relief in SQL Server 2012 (SP1) , MS has put a fix to use statistics information even for read only user (not necessarily be associated with any of the above user roles). You have a choice of disabling this behavior by using trace flag 9485, that means, enabling trace flag 9485 reverts the new permission check to the original behavior. But, be aware, this may not solve all your Linked Server performance issues. Please comment your experiences with Linked Server if you find anything interesting to be shared.